By living and working in Fresno, CA, you can get caught up in the day-to-day of life in the California city area. Even with so many options for activities and entertainment around you, sometimes you crave the relief of an escape from your cares, concerns and everyday responsibilities. When you’re looking for a getaway not far from home but removed enough to give you respite, how does a hotel resort near Fresno sound? As a luxury hotel and casino complete with a spa, fine dining and other amenities in Lemoore, CA, Tachi Palace Hotel & Casino has everything you need for a quick weekend getaway or an indulgent staycation. Hop on the CA-41 and in just 45 minutes you’ll be basking in the glow of Tachi Palace Hotel and Casino. The Tachi Palace Casino & Hotel is located in Lemoore, CA situated in the heart of the Central California’s San Joaquin Valley. 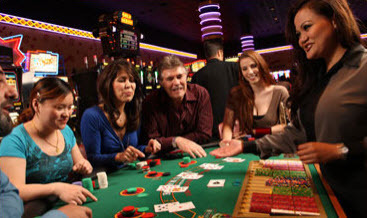 Our casino is the ideal getaway from everyday life in Fresno. Treat yourself and feel like you are worlds away in our beautiful casino, spa and hotel! Don’t forget about our bus service from Fresno! Check out our website for the schedule and location of pick ups and drop offs. When you’re looking for fun and excitement near Fresno, look no further than Tachi Palace Casino! Tachi Palace boasts two equally vivacious casinos with over 2000 gaming machines! Looking for a more mellow gaming experience? Look no further than our Casino of the Moon. With its colors and laid-back atmosphere, the casino of the Moon is great when you want a gaming experience without too much stimulation. For those looking for a more lively gaming experience check out our Casino of the Sun. Modeled after the vibrant sun, The Casino of the Sun is great when you want an enhanced gaming experience. Tachi also offers table games and a separate poker room. Hungry? Stop by one of our enticing restaurants including our Pork Chop Hill Buffet which boasts over 60 items to choose from daily! Dining: Looking for restaurants near Fresno? Tachi Palace has it all. With eight delicious dining locations, you could even call us a resort near Fresno. Spa Treatment: Need some time to relax and unwind with a little pampering? As a spa retreat near Fresno, Tachi Palace offers indulgent spa and body treatments to help you let go of the little worries that follow you from home. Entertainment: Looking for live music or concerts near Fresno? Tachi Palace is home to a host of entertainment. View our events to plan ahead for your visit. Indulgent Hotel Accommodations: With spacious, sensational rooms and suites complete with in-room dining, turn-down options, high thread count sheets, HD television, in-room WiFi and more, our seven-story luxury hotel will make you feel at home — or, dare we say, even better than at home. There’s so much to experience at Tachi you can’t do it all in just one day! Make a reservation at our luxurious hotel and treat yourself to a spacious room with high-thread count sheets and an evening turn-down service! It’s just like being at your home in Fresno but better! For those looking for extra space with a view we have beautiful loft suites. Don’t forget your swimsuit, our grand pool is a refreshing way to start or end your day. While enjoying the amenities of our hotel, stop by our full service spa and indulge in one of our spa packages. From body treatments, to massage and nails the possibilities are endless! Tachi Palace Hotel & Casino has something for everyone, whether you’re a gamer or just into pampering yourself. Let Tachi Palace be your oasis from the monotony of everyday life in Fresno. Visit us today!